I couldn’t have wished for anything more perfect for my first engagement session of 2019! It was in the middle of a BLIZZARD (literally, it was snowing sideways!) , there was an adorable pup, and the just sweetest couple! Megan and Lorenzo are getting married this December and how it all lined up that we got snow for their engagement session, was pure perfection! (thanks Mother Nature!) I had a BLAST with these three! I’m not going to lie and say we weren’t freezing our tushes off because we definitely were! It was 25 degrees with wind that could blow you over! Snow flakes blasting you in your eyes, sniffles, wet boots, and frozen fingers, it was COLD! But I don’t think I have to convince you that it was all so worth it because just LOOK at these two! You can’t even tell they were cold because we were having such a good time! They were so into each other and did the best they could to keep each other warm but hey, it made them snuggle up just a little bit tighter and I LOVED it! 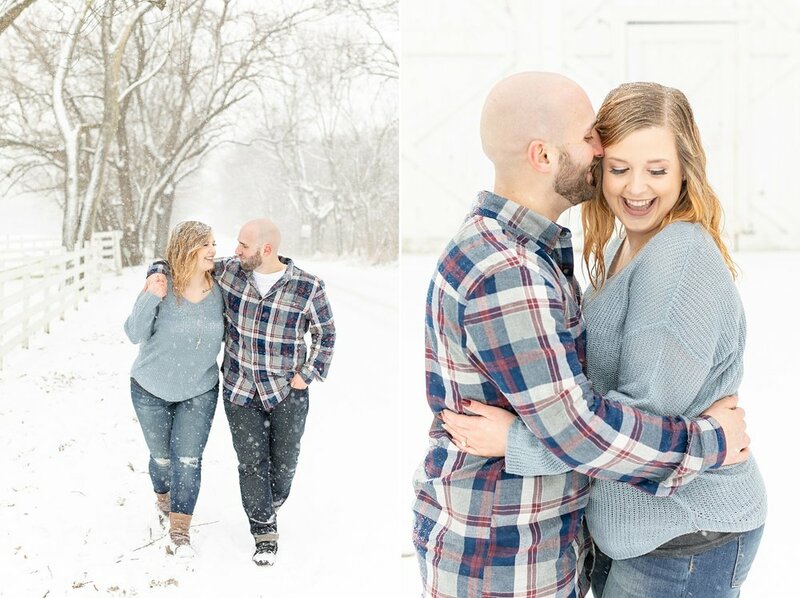 I am SO SO excited to capture these two tie the knot later this year in December and I hope we have such as much snow as we did during their engagement session! (because that would be MAGICAL!!) These two are just such sweet people and I’m honored to be a part of their story! I hope you enjoy some of my absolute FAVORITES from our time together!! This session might look cold, but it will for sure melt your heart! These are hands down some of my all time favorite winter photos to date! This location was absolutely PERFECT with this snow!! Megan is a HUGE rose gold fan and I am literally OBSESSED with her engagement ring! Great job Lorenzo!! It is stunning! !